Cyprian Southicke [aka Southack] / Em[anuel] Bowen Sculpt., THE HARBOUR OF CASCO BAY AND ISLANDS Adjacent. By Capt. CYPRIAN SOUTHICKE. London: Rich[ar]d Mount Tho[mas] Page and Company, 1720 [but 1721 or later]. Engraving, 17”h x 21 ½”w plus margins, uncolored. The earliest printed chart of Casco Bay, based on the surveys of Cyprian Southack, one of early New England’s most energetic and interesting figures. Southack was born in London in 1662 and emigrated to Boston in 1685. 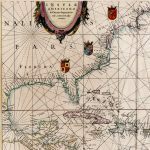 A man of enormous energy, he was active for decades as a privateer, naval captain, navigator, all-purpose diplomat and “fixer,” and of course map- and chart maker. Given the times and the rigors of his service, he must have been a man of great durability and good fortune, for he lived to the age of 84, dying in Boston in 1745. Southack left an abundance of records, in the form of diary entries, letters and reports laid in to his own annotated copy of The English Pilot. The Fourth Book (now at the Massachusetts Historical Society) as well as copious notations on his published charts. From these one gains the impression that he was everywhere, from New York to Quebec, though his activities were concentrated in Cape Breton, Nova Scotia and Maine. Most of this activity was in the service of Massachusetts Bay in particular and the English Empire in general, as it sought to wrest Canada from the French while protecting the New England coast and its shipping from the depredations of the French and their allied Indians. His most productive years were probably from 1696-1723, during which he commanded the Province Galley, Massachusetts’ one-ship navy (1696-1711); undertook numerous diplomatic missions to negotiate with the French over boundaries, prisoners, &c; oversaw the cleanup after the pirate ship Whydah foundered off Cape Cod (1717); and commanded the William Augustus, Nova Scotia’s version of the Province Galley (1721-23). Along the way he produced a number of landmark charts of the waters of British America, pursued fishing ventures in Nova Scotia, and fathered at least 11 children. For many years English settlers in coastal Maine were targeted for attack by the French-backed Abenaki and other indigenous groups. 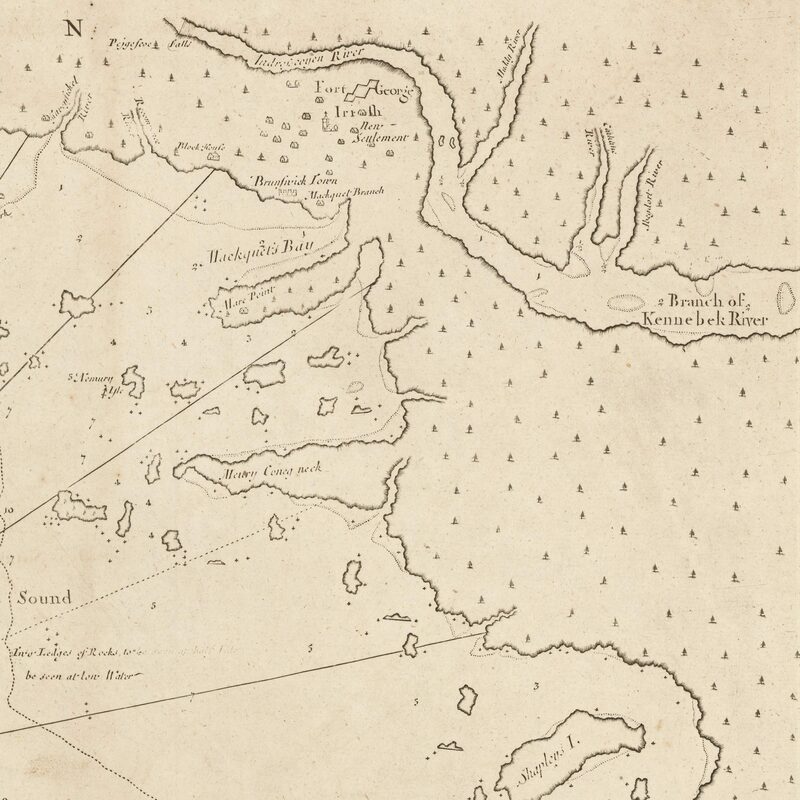 Cyprian Southack consequently made many trips to Casco Bay, including one in 1702, when as captain of the Province Galley he raised a siege of Fort Casco. 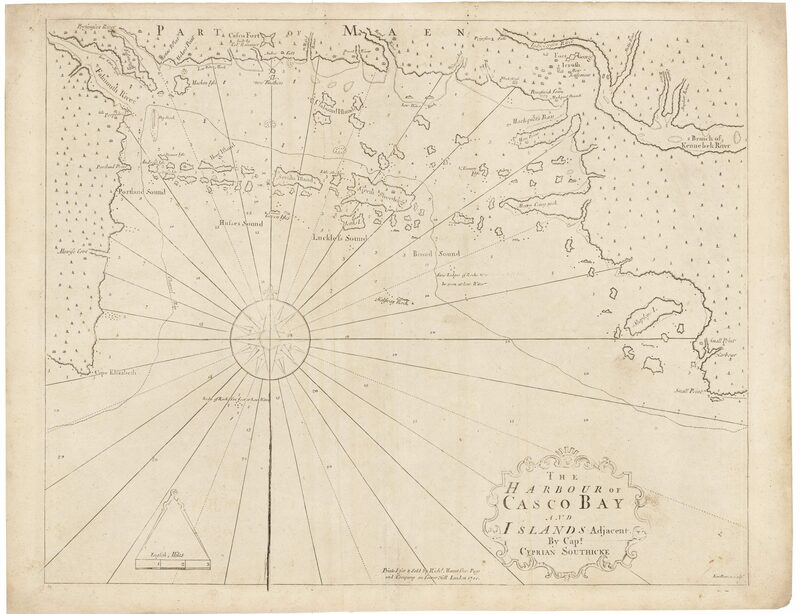 During these visits he assembled a considerable body of knowledge, which is reflected in this chart of The Harbour of Casco Bay and Islands Adjacent. Intended as a working chart, it provides considerable information on soundings, shoals and other navigational hazards, as well as a dotted line indicating a “Channel Way” for safely circumnavigating the Bay. 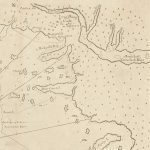 Interesting terrestrial details include settlements at Falmouth (now Portland) and Brunswick, the “Irish New Settlement” along the Kennebeck and “Casco Fort built by Col. Runamer” (“Runamer” was William Romer, a German military engineer serving in America under Governor Bellomont of Masssachusetts.) 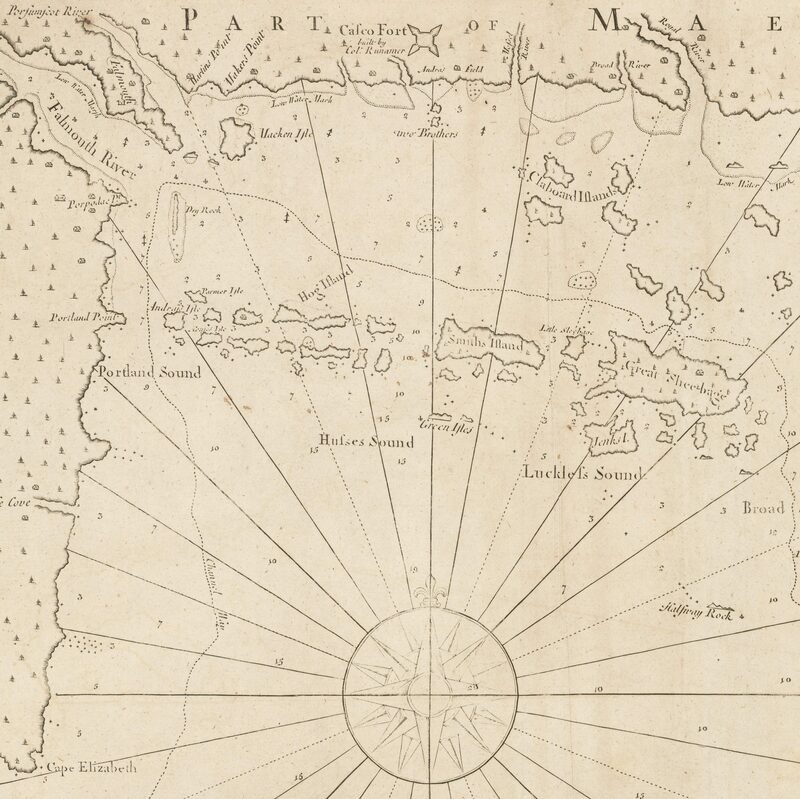 For all its merits as the first chart of the Bay, Southack’s work is deeply flawed, with islands seemingly drawn at random, missing peninsulas, and the whole rotated roughly 45 degrees from the correct orientation. Many of these errors, however, were likely the fault of publishers Mount & Page rather than Southack himself. Southack’s manuscript original still exists in the National Archives in London and is said to be far more accurate than this printed derivative. Offered here is a first edition of the chart. 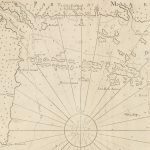 At some point in the mid-18th century a new edition of the chart was engraved, obviously by a different hand, bearing the imprint of John instead of Richard Mount, and with numerous small differences in geography, toponymy and hydrography. Wheat & Brun note a Boston edition of the chart, engraved by Francis Dewing and advertised in the Boston News-Letter for April 10-13, 1721, but no impressions have been located. 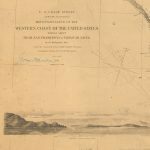 Osher Map Library, “The Cartographic Creation of New England,” #23. Phillips, Maps of America, p. 211 (1720 and 1758 editions). 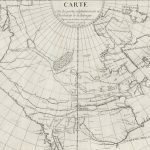 Sellers & Van Ee, Maps and Charts of North America and the West Indies, #841. Biographical information on Southack is from Clara Egli LeGear’s “The New England Coasting Pilot of Cyprian Southack ” (Imago Mundi no. XI, pp. 137-144), as well as Sinclair Hitchings’ “Guarding the New England Coast: The Naval Career of Cyprian Southack ” (Colonial Society of Massachusetts, Seafaring in Colonial Massachusetts, 1980, pp. 43-65). Minor discoloration and soiling, particularly at corners, but better than very good, with good margins.